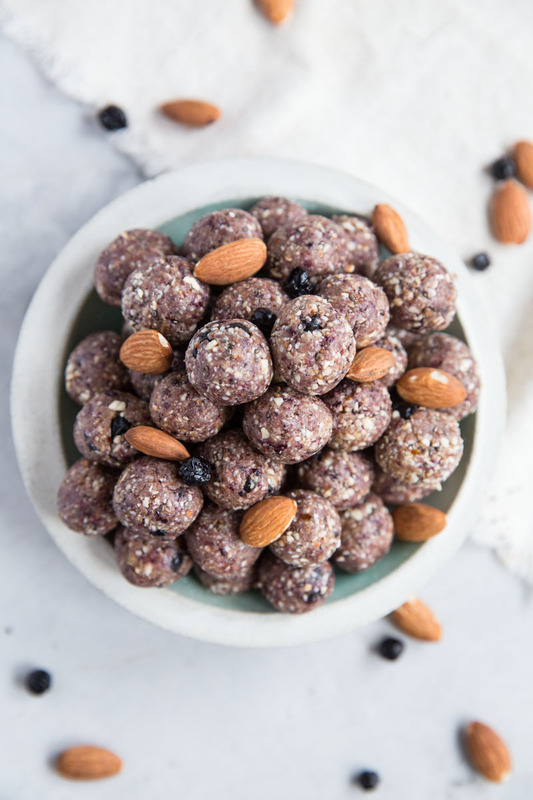 These Blueberry Almond Energy Bites are the perfect snack food to fuel Sumer activities like hiking, swimming, biking, traveling or chasing kids around the playground. 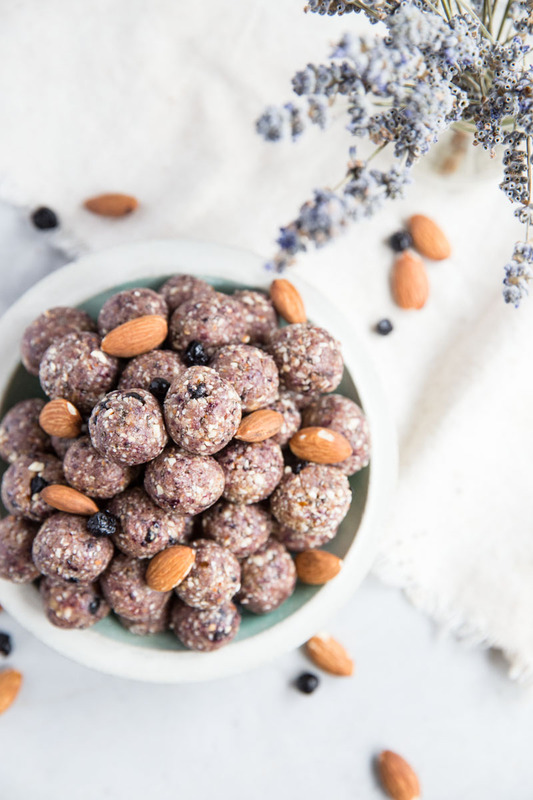 Just when I thought Energy Bites couldn’t get any better… I made these Almond Blueberry Energy Bites and just like that I have a new favorite healthy snack to fuel our Summer activities. Before these I literally thought I had created the best possible energy bite with this Energy Bite recipe. Like, look no further because you’ll just be disappointed, that kind of pridefulness. 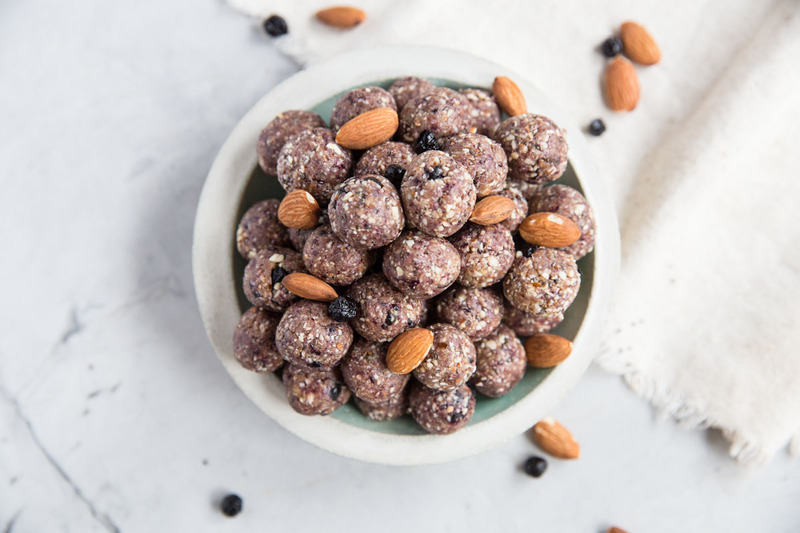 While my original energy bites are definitely tasty and still a tried-and-true recipe that I’ll keep going back to, it was time to change things up. My friend Melissa and I get together occasionally to make food in bulk while our kids play together. We always make one big batch of energy bites. I had mentioned wanting to try creating a blueberry almond version of my originals and when she said she had the ingredients we needed, we went for it. Let me tell you, what we created that day may be even better than my originals. These little bites have the flavor of a blueberry muffin and are so satisfying. Now, no one in my family will get outdoors for a hike or bike ride without throwing a few of these in their bag. I often bring a jar filled with them if we’re going on a all day excursion, like the zoo, swimming, or camping. And I always make a batch before we travel as a healthy travel snack that I know my whole family enjoys. Energy Bites don’t have caffeine in them and are not at all dangerous to give your kiddos. 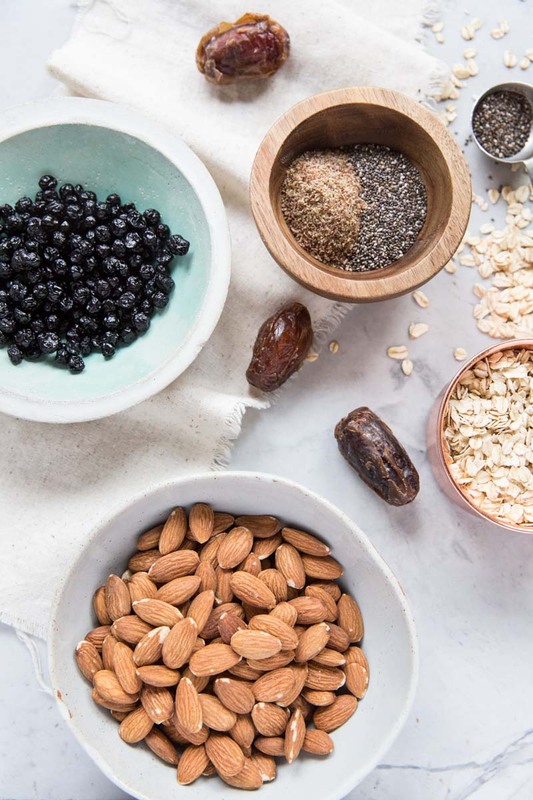 I found out recently that some parents avoid giving their kids energy bites because of their title but really these are healthy snacks loaded with nutrition and without any processed sugar. So actually, these are a way better snack for your kids than most processed sweet snacks you find at the store. I like to grind up the nuts and oats in the food processor before adding in the rest of the ingredients. Just grind them until they are processed into a flour-like powder then continue with the rest of the additions. 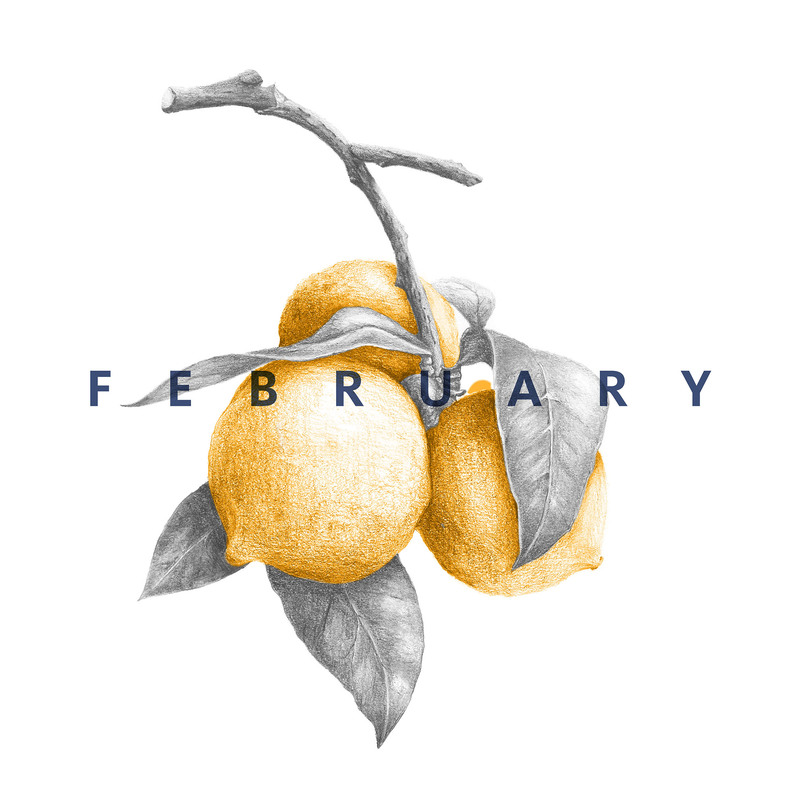 Dates. I LOVE dates! For energy bites I use medjool dates, always. They are the right size and quantity for the recipe, plus they just taste better and give the right consistency. You can find them in bulk bins or packaged up sometimes near the produce areas of grocery stores. The only time consuming part of this recipe is rolling them into balls. My smart and very efficient friend, Melissa, came up with the idea to spoon them out into mini silicone muffin trays and put that in the fridge or freezer for a short time before rolling them out. Or you can press them into the silicone molds and then just pop them out into a bag or jar for storing. I have another friend who has an aversion to eating tiny bites or balls of food so if you’re like him, you can also roll this out between two sheets of parchment and then cut into bars for a raw granola bar. Bob’s Red Mill Ground Flax Seeds are easy to digest and give a mild-nutty flavor with tons of omega-3 fatty acids. Other uses for flaxseed mill – smoothies, cereal, baked goods, egg replacement. 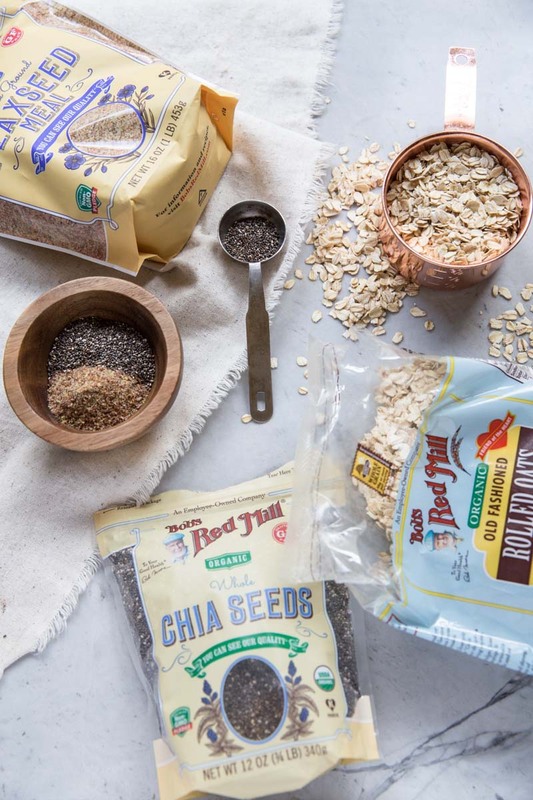 Bob’s Red Mill Chia Seeds are packed with antioxidants, omega-3s, and fiber. While many use these for chia puddings, I love throwing chia seeds into energy bites, granola bars, and granola. Bob’s Red Mill Old Fashioned Rolled Oats are thick and chewy and so substantial in comparison with other oats. These make the energy bites filling and sustaining for Summer activities. Pick up the gluten free version if you diet requires. 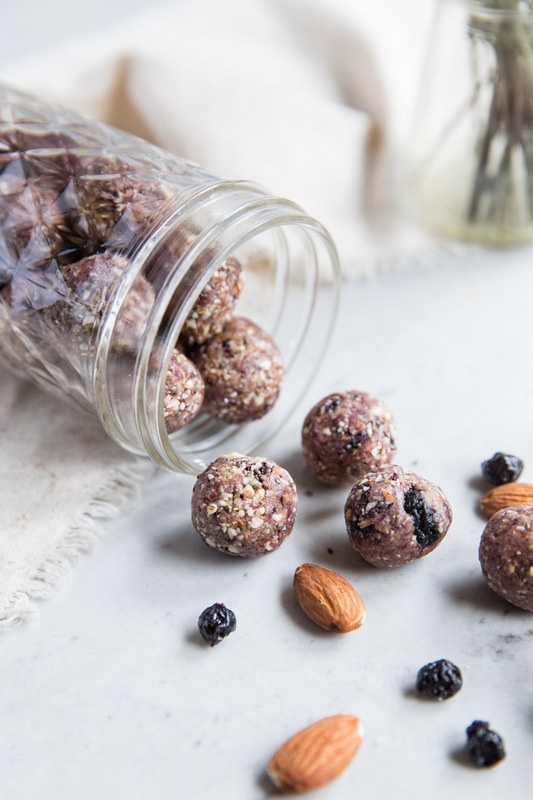 Weather you’re running in a race, camping, hiking, or just chasing your kids around at the park, you’re going to want to stock up on these for a healthy snack this Summer. 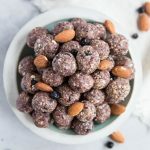 These Blueberry Almond Energy Bites are easy to love as they taste like blueberry muffins and yet are perfectly healthy. In a food processor, grind up the oats and nuts until they are a flour-like powder. Add in the seeds, dates, 1/3 cup of the blueberries, salt, and almond extract (if using). Pulse until well incorporated. Add honey until a ball forms (should be 3-4 tablespoons worth). Taste and adjust sweetness or saltiness to your preference. 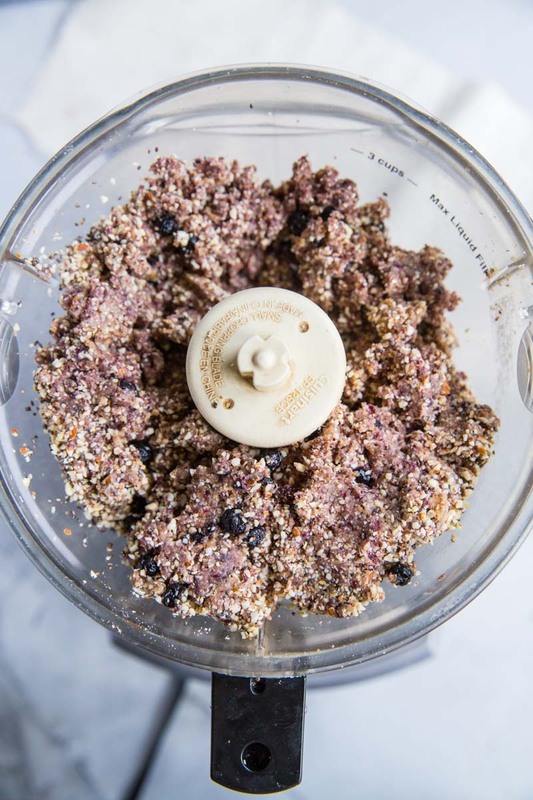 Add in remaining dried blueberries and pulse just a few times to incorporate but still leave a few large chunks of blueberries throughout. Roll into balls, or press into silicone mini muffin pan and refrigerate until hard then pop out. Store in an air tight container in the fridge. Can’t wait to try this version! Thanks for posting! 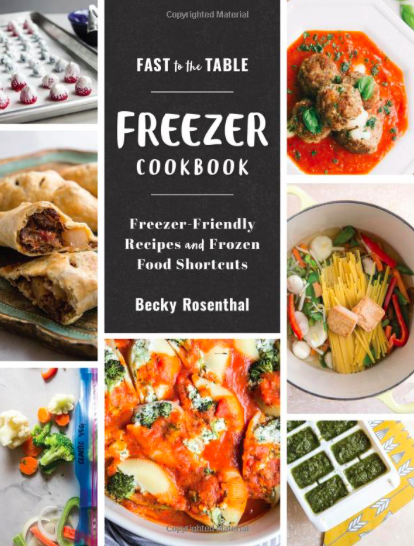 Can you use fresh blueberries instead of dried? Hi Hannah, fresh blueberries would be too wet for the recipe and the dried blueberries have a concentrated flavor that really boosts the taste of the energy bites. Let me know if you have any other questions!